Women who are going to do a session with me often ask for beauty advice for the day of the photo shoot. They most often are worried about how to style their hair, how to do their makeup & whether they should tan, depending on their skin tone. I can recommend some hair stylists and make up artists that do wonderful work, but they need to be booked in advance and some clients may not want to pay the extra money to get professionally done up. SO, I am going to share some great, tried-and-true, last-minute, budget friendly beauty tips for looking your best in photos. The first thing you need to decide is what sort of feeling you are going for in the images. Are you trying to look like your everyday self with a little extra shine or does the photo shoot have a theme or special event involved where you really want to look runway-worthy? Your personal style will largely dictate what you are comfortable doing (and how much of it) when it comes to beauty. No matter how much makeup or how much styling you decide to do for your hair, remember that in photos, generally more is better. You want everything to be a bit bolder than you would normally have it because it will help your features pop in photos. Generally, do your hair in a style you are very comfortable doing yourself, one that you like a lot & wear often. For hair in photos, usually bigger is better! Whether you are doing straight, wavy or curly hair, don’t forget to add some volume at the root either with a teasing comb & a bit of hairspray or with a round brush, some lifting mousse & your hair dryer. Take hair in small sections and tease the bottom 2 inches close to your scalp then brush over the hair to create a smooth appearance or use your round brush to dry damp hair up and away from your scalp. The volume at the root will help frame your face nicely in your images no matter what length or texture your hair. If you want fuller or longer hair quickly, and you don’t keep extensions in regularly, I recommend getting some clip-in extensions. Amazon.com has some very affordable products that are perfect for a few hour photo session or a night out. They are re-usable so you can use them for more than just your session day. 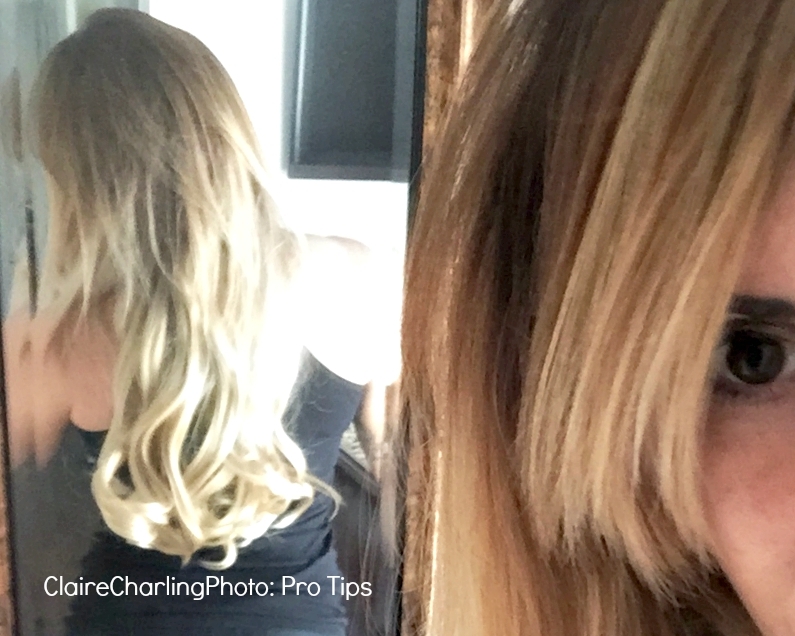 I have had several ladies use clip-ins during their sessions & you honestly can’t tell. The ones shown in the photo are single-weft, 22-inch synthetic hair I purchased on Amazon (2 for about $30). The color is an ombre ash blond to match my hair color and pre-styled in light curls. When picking extensions for your hair, make sure you know the color level and tone your hair is colored- ask your stylist if you are not sure. That way you can get a decent match. Most of the cheaper extensions are not real human hair- they are synthetic. This is totally fine & they will look just as great in images. Just keep in mind that you CANNOT style these extensions with heat, so order a kind that is already styled the way you want to wear your hair. Hair tools will burn synthetic hair. Don’t use hairspray in your extensions. They should already be styled to hold and adding spray will only create a giant tangle as the hair catches on itself. Don’t brush your hair out too much- the same thing will happen as putting spray on them. The best thing to do is to gently mold the curls or pull a straight style with your fingers. Use a non-bristled brush if needed. Clip-In extensions come in either single wefts which are about 8 inches across & span the whole horizontal length of your scalp, OR smaller wefts which you can add-in around your head as you choose. If you are looking just to add some volume or thicken up your hair, I recommend the small wefts. If you are wanting some serious length, I recommend getting the single weft. Get 1 if your hair is finer and 2 if your hair is thicker. Apply the extensions by parting your hair horizontally and lightly teasing your own hair close to your scalp. Finish by lightly spraying your own hair prior to putting in the weft. This will help the clips hold tightly. If adding 2 wefts, do this twice & low enough so that the clips cannot be seen. The single clip extensions are the same application except you can choose where to add them. Be sure the finished product looks pretty even. The clips are strong and you should be able to pull on the hair pretty firmly without it budging. Storage & Care: You can use a LITTLE bit of a weightless Argan oil type spray to help keep the shine & to get the tangles out of your extensions when you take them out. Make sure you store them laying flat. Mine came with a hairnet which I saved and use to put around the hair when it is being stored. If they are curled, gently shape the curls into ringlets, place a hairnet or a plastic bag around them and lay flat. Didn’t have a chance to make it to the tanning salon? Don’t like the UV damage caused by a tanning bed? Never fear: I have a couple of products to help you get a great glow without spending the money on a spray tan or if you waited until the last minute & want to look tan. 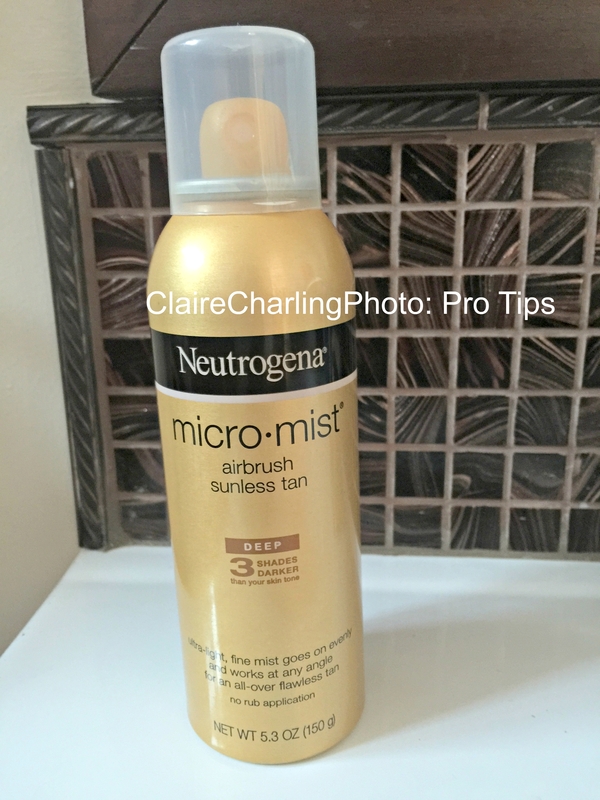 The first is Neutrogena Micro-Mist self tanner. I like the ‘Deep’ color because it is more noticeable. I have found this product to not appear orange or spotty. Apply after exfoliating your skin in the shower. Spray evenly 8-10 inches away from skin & let dry for a few minutes. Use your regular moisturizer after the product is dry and rub evenly. This will help avoid any uneven spots or spray marks. All self tanners I have ever tried smell awful, so I recommend using this product over night & washing it off in the morning. The tan stays but the smell is gone. To build a serious glow, use for 3 nights in a row, follow up by once or twice weekly touch-up to maintain. 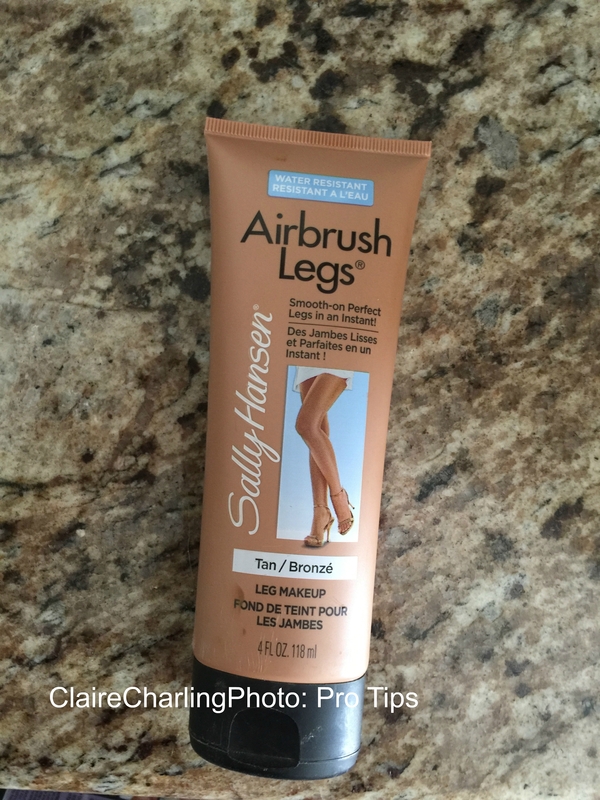 This product is available at a ton of stores- Target, CVS, Walgreens and even Safeway to name a few & I would recommend spending the $11 bucks on this brand as opposed to other cheaper ones because the color and quality of the tan is better in my opinion. The second secret to an amazing looking tan in your images is leg makeup. Yes, I said leg makeup. I like Sally Hansen Airbrush Legs. This product is inexpensive and available at CVS. This stuff is amazing! Apply like lotion & then use your regular moisturizer after to blend it better. It washes off your hands and yourself with soap and water when ready. Be careful if you are planning on wearing white and consider using a towel under your legs on your car seat though. While the product is water resistant, it is NOT waterproof or sweatproof and will possibly bleed orangey color onto fabrics it comes into contact with. That being said, for a few hour photo session, you can achieve a great looking tan instantly: Voila! No time to fit a manicure into your schedule prior to your session? No problem, this next product will save your hands in your images: Stick-on nails! While there are a lot of cool products out there, I recently tried an $8 product that I loved! It is called ‘IMPress’ waterproof stick-on nail and you can get these firmly adhered nails in a french or in a color. While they may or may not last more than a day, they definitely should last through your session! Sorry the photo shown is such poor quality- I just cropped it out of one of my photos that was much larger. Select the sizes for all of your nails prior to starting application and lay them out. For best results, use nails slightly smaller than your real nail. Apply each nail as directed, they are stronger the more pressure you apply so it is recommended that you continue to apply pressure occasionally for 30 mins after you initially bond the nail. Apply your thumbs last, after applying the other 8 nails. Your makeup application should reflect your style & like your hair, it should be something you are comfortable wearing. In addition to your everyday routine, I recommend going a bit heavier on the mascara and brows than you normally would. While you may think it looks a bit over-the-top in the mirror, in photos, you will be surprised at how nicely a well drawn eyebrow & large lashes can help your eyes pop. Nicely lined lips, with a not-to-shiny color or light gloss help you look polished in photos. Also, be sure to wear some blush at the very least, or if you are comfortable with it, you can use some contouring techniques using highlighter and bronzer. Don’t get too heavy-handed with contours as it can absorb the natural light on your face and actually make shadows more severe. Remember that any highlighter, eyeshadow or lip gloss that is too shiny will catch the light and make flares in your images. The same applies for large or flashy jewelry near your face. If you normally wear glasses, I recommend taking at least half, if not most of your photos without them. We want to see your face after all! If your glasses are a part of your style, then take some of your images with them, but I still recommend getting some without so you can choose after your session between images with or without. You can get falsies at any drugstore and, if you are comfortable wearing them, I recommend getting a ‘natural’ looking one that will blend into your own lashes well. If you are a newbie at falsies, get the single pieced ones, not the tiny sectioned ones. Before applying them, measure them out and trim them to an appropriate length to fit the width of your eye. 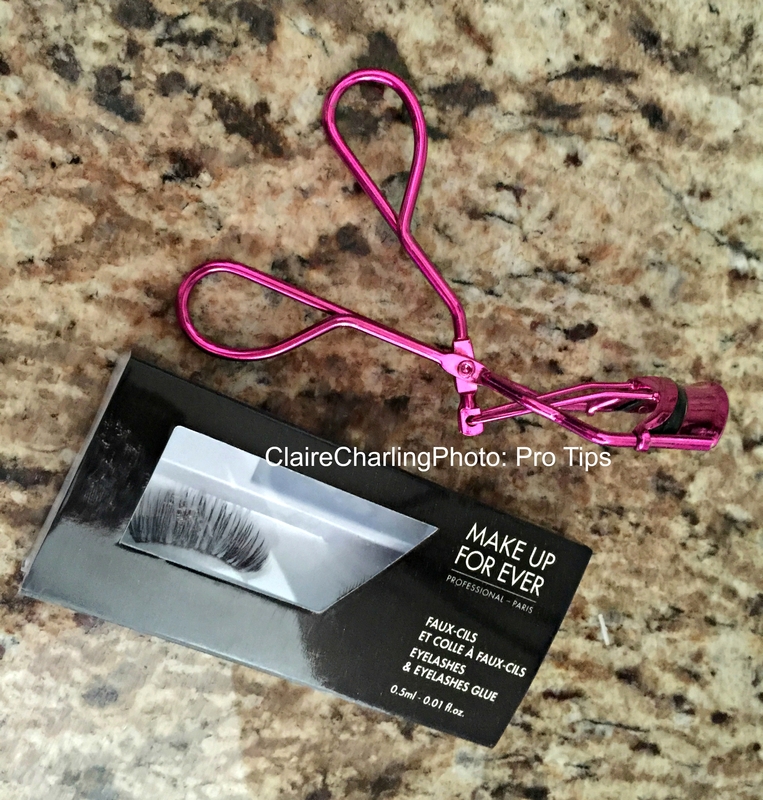 Use an eyelash curler to curl your own lashes prior to application. I use q-tips and a pair of old tweezers to apply the glue to the lash and then position mine on my eye. Apply your lashes before applying other eye makeup so the glue holds better. 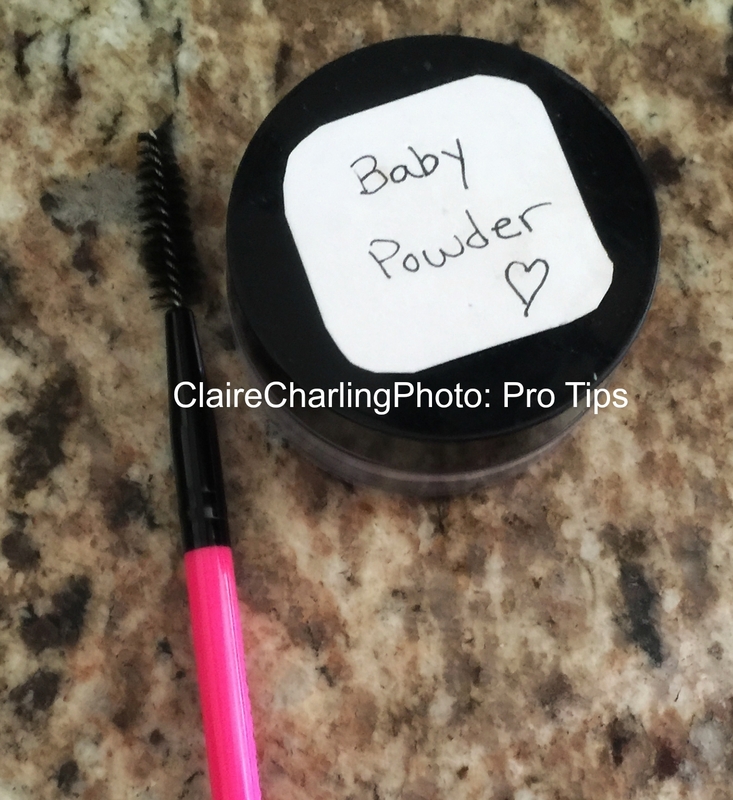 If you are not a falsies type of girl, and you don’t own a lash primer: I recommend using bab y powder on your lashes prior to applying your mascara to make them look thicker and longer. Curl your lashes, then apply the powder using a lash brush, and finally apply at least 3 coats of mascara over. Professionals often use multiple types of mascara also to add volume. I use 3 different kinds of mascara after I apply my lash primer. Even if you don’t normally color in your brows, you should for your photos! Eyebrows are one of the most defining features for a face. For a natural-looking eyebrow, use a color brow dip or even a flat (non-shiny) eyeshadow that is very close to your natural color (or that compliments the color your hair is dyed if it is a different shade.) My absolute favorite brow makeup is Anastasia Beverly Hills Brow Pomade. I use an angled eyeshadow brush to color in my natural shape brow. I have also used a flat shade of brown eyeshadow with an angled brush for a cheaper alternative.